This is my family’s very favorite salad of late. Not only is it delicious and beautiful, it’s really easy too. It’s kind of a riff on the Mandarin Spinach salad I shared with you a little while back, as it uses the same dressing. To make the dressing, you just shake the ingredients in a jar with a tight-fitting lid. I’ve discovered that my family isn’t a huge fan of vinegar, so I usually cut back on that a bit, using one tablespoon instead of two. 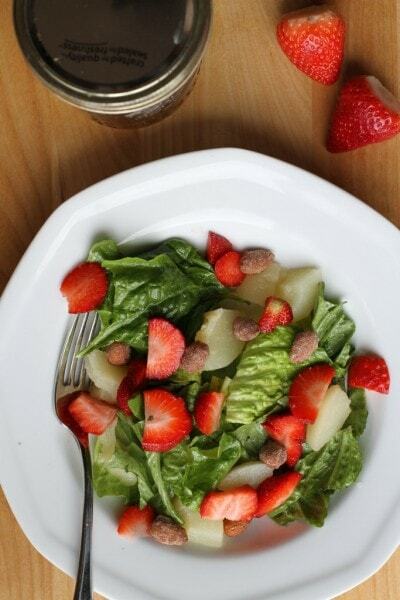 Once you’ve made the dressing , you just toss it with torn Romaine lettuce, sprinkle in sliced strawberries, sliced pears, and top it with sugared almonds. These particular almonds are from an Aldi special buy at the holidays (my goodness, they were SO good!) but if you’d like to make your own nutty salad topping, just follow the directions on the Mandarin Spinach salad recipe. Or you could make these spiced nuts. If you don’t have any perfectly ripened pears at your house, you can use canned, drained pears (which is what I usually do!). You’ll need to use fresh strawberries, though…if you use frozen, thawed berries, they’ll be way too mushy to be enjoyable. But hey, strawberry season will soon be upon us, so you can make this to your heart’s content with fresh, local berries. I think this salad is WAY better if you toss the lettuce with the dressing rather than drizzling it over each serving. But be careful not to dress more salad than you’ll eat in one sitting, because dressed salad will wilt over time and become significantly less appealing. Toss lettuce with dressing to taste (see below). 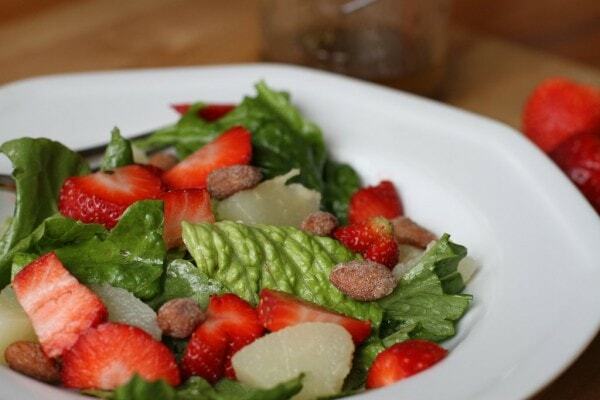 Toss in pears and strawberries, and sprinkle nuts over top of the salad. 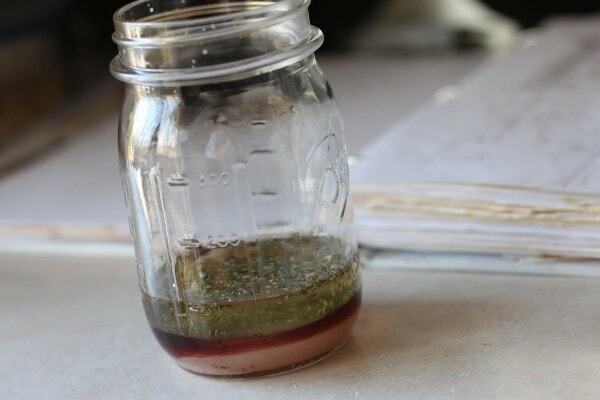 Combine ingredients in a jar with a tight-fitting lid and shake until combined. Store leftover dressing in the refrigerator. Yum, this looks tasty. 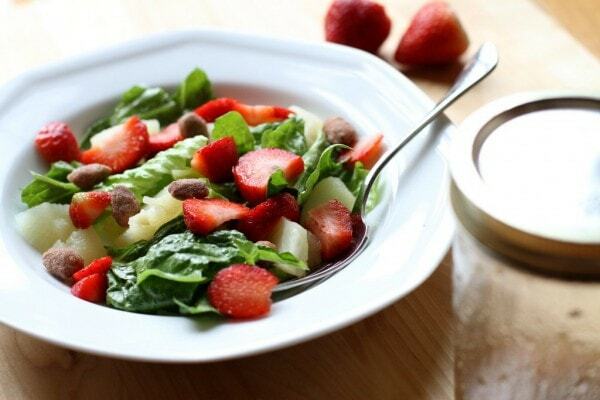 I hadn’t thought of using strawberries in salad, but I do like oranges in mine. 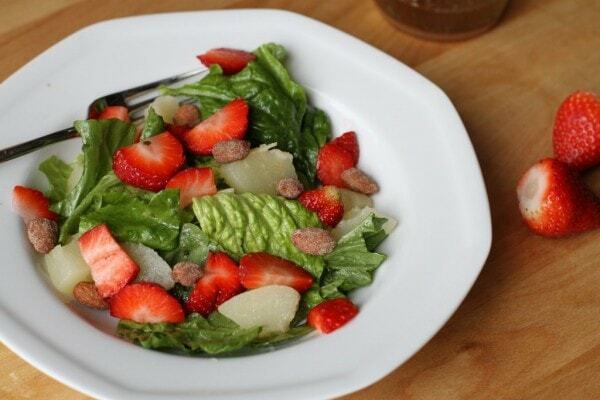 I would probably skip the sugar in the dressing though, because of the sweetness of the strawberries. Oh I will be making this, rest assured. 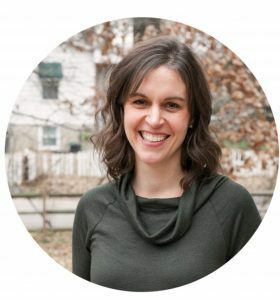 Anything I can do to get more healthy stuff into the family. Thank you. That looks so delicious! I can certainly see why it’s fast becoming a family fave. I know that I would love it too, because I love vinegar and strawberries together. In fact on of my favorite ways to eat strawberries is drizzled with balsamic vinegar, and sprinkled with a bit of sugar, and black pepper. I let it sit for an hour while I get the rest of dinner ready. It sounds like such an odd combination, but the vinegar compliments the berries. Now I can hardly wait for strawberry season! I know. It IS coming. Just not fast enough! I can`t wait for strawberry season! This recipe would be great for a nice spring picnic in the park! I have been trying to find some good salads in order to eat more lettuce, this will do it. I love strawberries! Always on the lookout for a good vinegar and fruit salad here. I hadn’t thought of shaking the greens with the dressing separate from the fruit. Though simple, you have helped me quite a bit in making my salads more presentable and delicious. Like boiling a frog, right? This looks super fresh and yummy! I might be the only one to eat it here though since my hubby hates salad. I can polish off a LOT of this all by myself, so if you’re like me, then you could certainly make a half recipe even if you’re the only one eating it! This looks absolutely divine! I just bought some strawberries..this will be on the menu tomorrow! :)! It sounds delicious! I made spinach with strawberries and mandarin oranges a while back (http://frugalandthankful.blogspot.com/2012/06/delicious-summer-spinach-salad.html), and kids love it! Can’t wait to try your version! Tabasco sauce is a nice touch! I’ll have to use this recipe – I often use blackberries, raspberries, even orange slices in a green salad – love strawberries! Question for ya – is the 2 tablespoons of sugar in the dressing correct? I made it and it was sooo sweet, like a syrup?! I had to pore it out. Did you mean to say 2 tsp, or do we just have very different tastes in a salad dressing? It IS a pretty sweet dressing…which is probably why we like it. But if you prefer a less sweet dressing, I’d start with 2 teaspoons and go from there, maybe?